Great Muses For Great Designers. They were great friends and through tight collaboration helped each other rise to success. Who does not know about her black dress in “Breakfast at Tiffany’s”? There were many more in countless Audrey’s movies. Givernchy understood her petite fragile figure and was inspired by her open child-like personality. Audrey once said “His are the only clothes in which I am myself. He is far more than a couturier, he is a creator of personality”. Their friendship began in 1953, years before Givenchy label was established, and lasted for over 40 years. 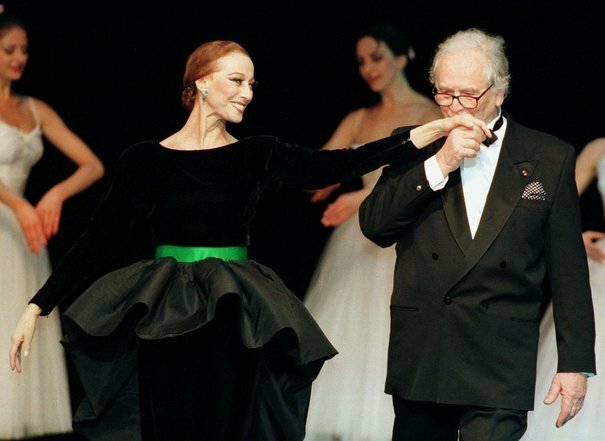 Maya Plisetskaya is a legendary Russian prima ballerina, who became prima at age 40 and danced lead roles through her late 60’s, was Pierre Cardin’s biggest muse. Few people know that the famous designer made over 30 visits to Moscow during his career. They met at her open air performance after which Pierre was left mesmerized with her frail figure, and famous Swan Lake dance. Now both retired, Pierre and Maya keep in touch by paying each other visits in France and Moscow. Madonna’s signature cone bra will for ever be associated with Jean Paul Gaultier style. Their friendship goes back to early 1980’s. Just recently at Jean Gaultier’s exhibition in Paris, Madonn’a bra gained more publicity than the Gaultier’s show itself. Gaultier’s created a famous corset for her 1990 Blonde Ambition tour. Two rebellious souls have collaborated for over 30 years with Gaultier keeping busy making most of her outfits for the singing shows. The most resent one was for her 2006 Confessions tour. Ann Hathaway is Valentino’s last and most famous muse. She has been wearing Valentino for years to all kind of red carpet appearances, but just this year a pair revealed their friendship to public after past Oscar. Valentino said that Ann Hathaway is like a daughter to him and that he will continue making beautiful gowns for a Hollywood beauty. Valentino was around long enough to do magic for many American’s, including Jacqueline Kennedy for whom he designed a wedding dress and for Nancy Reagan for whom he made countless outfits for her public appearances. Ann Hathaway was a new fresh face for a designer who sought youth for his last designs before officially retiring 5 years ago. Charlize Theron wears Galliano’s creations for most of her red carpet appearances. She continues to be Dior’s face after Galliano left the fashion house, but it was with Galliano when friendship began. Similar to Audrey Hepburn with Givenchy perfume, Charlize Theron will be forever associated with Dior’s J’adore fragrance that came out close to a decade ago. She wore his dress to receive Oscar award and was among very few to stand by him through out his Dior firing ordeal. A true friend knows the designer better than public, she kept in touch during his lengthy rehab last year.